Audio Recorder Pro, a high quality voice recording app, store your sound recordings as voice memos and share them ON THE CLOUD with your friends, this application uses the high quality (41.1KHz sample rate) to give you the best recording experience. This app is simple UI, instant start and easy to use. Features: - Best Feature of All? IT'S FREE! 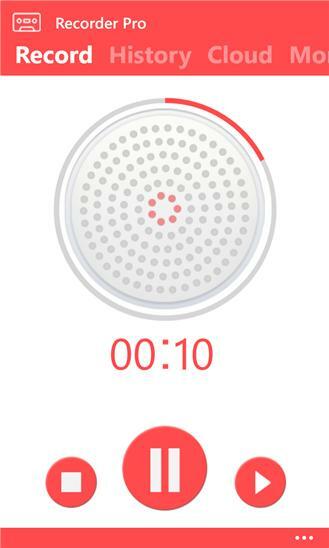 - Beautifully animated and intuitive user interface with large, easy to touch buttons - Pause and continue both recording and playback - Continue recording to an existing recording - Interruption protection allows you to continue recording after a phone call interruption - Optional new recording indicators both within SpeakEasy and on the home screen icon - On the go recording options allow for quick start and save - Call recording make it a spy recorder - Attractive and easy to use UI - Use microphones, headsets etc. - For text files on Facebook and E-mail, Dropbox, SkyDrive ,Box. - Dream Talk Recorder records your talks while you, your partner or your kids are talking or snoring in dreams - Bluetooth and external headset support - Best voice recorder application with stunning interface for business, audio professional, journalists,teachers,sound engineer, doctors,journalist, lecturer, school/college student and anyone else who needs to manage voice memos. Taking lecture notes, conducting an interview or just immediately jotting down a good idea has never been easier! You will love to open this gorgeous app every time.